There are five Youth Religious Emblems available through the NCCS for boys. 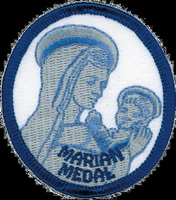 Two can be earned by Cub Scouts, two can be earned by Boy Scouts, Venturing crew members ( as well as registered Sea Scouts and Explorers) who are practicing Catholics of the appropriate age. The Light of Christ Activity book is now printed with both English and Spanish instructions in the same book. The requirements are the same as the previous book. The Parvuli Dei Activity book is now printed with the introduction in English and Spanish. The requirements are the same as the previous book. The Light of Christ emblem can be earned by Tiger and Wolf Cub Scouts. The Parvuli Dei emblem can be earned by Bear and Webelos Cub Scouts. Cub Scout emblems are completed in a family setting with assistance of a trained Religious Emblems coordinator from your /local parish. These programs take approximately two months to complete. Cub Scouts receive their square knots and emblems (medals) in their local parishes and Cub Scout packs. The trained Religious Emblems coordinator you have been working with will submit the completed application found in the workbook to our Archdiocesan Catholic Committee through the local Boy Scout Catholic Relationship Committee. This coordinator is your contact to obtain the religious emblem. The Ad Altare Dei emblem can be earned by Roman Catholic Scouts. The Light is Life emblem can be earned by Eastern Catholic Scouts. The Ad Altare Dei and Light is Life emblems are completed during scheduled meetings led by a trained Religious Emblems Counselor, with outside homework, and take approximately 5-7 months to complete. The Pope Pius XII emblem is completed at scheduled meetings led by the participants, and moderated by a trained Religious Emblems Facilitator, with outside homework. It takes approximately 9-12 sessions (4-6 months) to complete. Upon completion, each candidate will meet with a Board of Review to discuss what the Scout/Venturer has learned. After this review, the Scout/Venturer will receive a BSA religious square knot at an appropriate unit presentation (Unit Meeting, Court of Honor), and the religious emblem (medal) at the next annual Emblems Ceremony at St. Patrick's Cathedral, which is usually held on a Sunday in the spring after Easter. Emblem Books may be obtained most economically and quickly from your local BSA Council Service Center Scout Shops or from Scoutstuff.org and Praypub.org. Alternatively, they can be obtained directly on line at our CYO Scouting on-line store. Many local scout Catholic committees have a stock of the books available so check with your local parish or Scout council committee about obtaining the workbooks. The Light is Life book for Boy Scouts belonging to the Eastern Catholic Churches can generally be obtained only from your Eparchial Catholic Committee on Scouting or directly from NCCS at . The trained Religious Emblems Counselor/Facilitatorr you have been working with will submit the completed application found in the workbook to our Archdiocesan Catholic Committee through the local Boy Scout Catholic Relationship Committee. This coordinator is your contact to obtain the religious emblem. There are four Catholic Religious Emblems available to Girl Scouts. Books may also be ordered from our Office of Scouting by ordering via our on-line store. 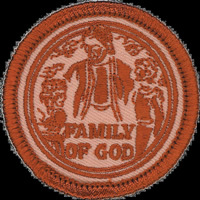 The Family of God program is the official religious recognition program of the Roman Catholic Church in the U.S.A. for children ages 7-9, who are enrolled in the Girl Scouts of the U.S.A. The Family of God is an activity series developed to complement the catechetical efforts of the parish and families with children in the second and third grades. This religious emblem is usually presented in the local parish. The I Live My Faith program is designed to help Girl Scouts, ages 9-11, appreciate more deeply the place that God and religion occupy in their daily life. This religious emblem is usually presented in the local parish. Through Mary, the First Disciple (Marian Medal), young Catholics (ages 12-15) will grow in appreciation of Mary and in understanding themselves. They will meet Mary in Scripture as a young teenager and will follow her journey, as she becomes a woman and the Mother of God. This religious emblem (medal) is usually presented at the next annual Emblems Ceremony at St. Patrick's Cathedral, which is usually held on a Sunday in the spring after Easter. The Spirit Alive program is designed for Catholic youth in high school who are in the Senior level of Girl Scouts. It assists them in discovering how the Holy Spirit moves in their lives, calling them to greater participation in the church’s ministry. This religious emblem (medal) is usually presented at the next annual Emblems Ceremony at St. Patrick's Cathedral, which is usually held on a Sunday in the spring after Easter.